It’s been already 3 weeks into the new 2019 year! Crazy, isn’t it? Before we know it spring will be around the corner. So now is the best time to start working on that booty – gym-wise, food-wise and of course we should not forget about our skin. But no need to panic, you have plenty of time to get ready for summer, don’t you worry, we have everything set for you. Today we will talk about the best anti cellulite massage oils to use at home. Yes, we all have cellulite (I am talking to you, ladies. Men, perhaps you would be more interested in our gifts guide ;). However, it does not mean that we should give up on improving the skin condition. Because just a bit of time, consistency and a good anti cellulite massage oil will work wonders. Consistency is the most important here – if you allocate just 10 minutes but every day, you will see the results very soon. Whereas, massaging your thighs once a month for an hour is almost a waste of your time. So why is it important to stick to an everyday massage routine? The main purpose of the anti cellulite massage is to improve blood circulation. This in its turn will also make sure that the skin cells receive all the essential nutrition and the process of toxins elimination will speed up. Consequently, the swelling of the body will reduce. What is also important to mention is that one of the causes of cellulite bumps is the slowing down of lymph flow. So massage will facilitate this process and help making the skin more even. Additionally, anti cellulite massage helps relaxing the muscles and getting rid of excess water in the tissues. Which one to choose: a ready mix of a DIY kit? With the abundance of options for anti cellulite massage oils all you need to have is motivation, dedication and a bit of time. In fact, nowadays there are a lot of choices on the market from ready to use oils mixtures to individual essential oils kits if you into creating your own. For instance, Edens Garden Cellulite 10 ml Synergy Blend 100% Pure Undiluted Therapeutic Grade GC/MS Certified Essential Oil is our favorite option if you are looking for an effective composition where the different essential oils are brought to the ideal proportions. Grapefruit (Citrus paradisi), Juniper Berry (Juniperus communis), Cypress (Cupressus sempervirens), May Chang (Litsea cubeba), Cedarwood (Cedrus atlantica), Fir Needle (Abies sibirica), Sage (Salvia officinalis), Pink Pepper (Schinus molle), Birch (Betula lenta), Fennel (Foeniculum vulgare dulce), Black Pepper (Piper nigrum). Essentially, all you need to do is to dilute it with a carrier oil (grapeseed, jojoba, coconut oil etc.) It is recommended to follow a 3% dilution rate, which means 15-18 drops of essential oil per 2 Tbsp. of carrier. On the other hand, if you want to completely avoid all the hassle around mixing the oils, look out for this best seller, Baebody Massage Oil – Fight the Appearance of Cellulite – with Grapeseed Oil, Eucalyptus Oil, Lemon Oil, and Grapefruit Oil, Penetrates Deeper than Cream, 8 OZ, with a simple but extremely effective composition of only 4 oils: grapeseed, eucalyptus, lemon and grapefruit. So, with an almost perfect review score, this product delivers fast results: the skin becomes tightened and toned. Above all, the extra benefit is that the ingredients are all natural and high quality. It is recommended to use this anti cellulite massage oil mix with a cellulite massage mitt, for example Scala Cellulite Massager and Remover Brush Mitt. Finally, if you want to create your own anti-cellulite oil mix, keep on reading about the best essential oils to fight cellulite. 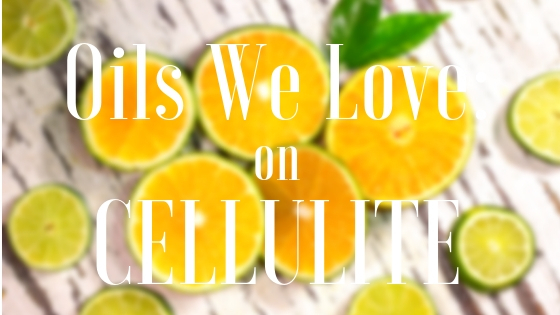 Certainly, citrus oils rank first in fighting cellulite. Orange essential oil increases blood circulation, tones and moisturizes the skin (thanks to Vitamin C). Besides that, grapefruit essential oil helps eliminating toxins and excess water. Also, its fragrance reduces appetite, and we all know that moderate healthy eating is key in losing extra pounds and getting rid of cellulite. Finally, apart from the above mentioned benefits, lemon essential oil is especially effective in reducing stretch marks. Attention: Keep in mind that due to the fact that citrus essential oils may increase skin sensitivity, it is advised to avoid using them before sun bathing. This one became a revelation for me! Not only cypress essential oil helps increasing blood circulation, eliminating toxins and therefore evening the cellulite bumps, but it also is famous for curing the varicose spider veins. It is not surprising though, because both cellulite and varicose have similar root causes. It is of course a result of many factors, including hereditary, but it’s a fact that liquids congestion in tissues is a common symptom for both cellulite and varicose. Dilute several drops of cypress essential oil with a carrier oil, for example fractured coconut oil, and add a bit of lemongrass essential oil for extra boost and fragrance. Apply twice a day for a month and then switch to once per day. As mentioned above, lemongrass essential oil is a great addition to anti cellulite oil mix, especially due to its uplifting fragrance that is known to improve the mood and increase the energy. But it is also great on its own, thanks to its abilities to flush out excess water and therefore reduce the appearance of cellulite. Geranium essential oil is one of the best anti cellulite massage oils to use at home. While improving blood circulation and stimulating lymphatic system, it also regulates hormones and improves the skin tone. Sounds like an all-inclusive deal to me! Fennel essential oil is probably the most powerful in terms of eliminating the toxins due to its diuretic properties. It is also famous for boosting collagen production because some of its components act like estrogen. All this makes the skin to look healthier, denser and smoother. One thing to be aware of is that in case you are undergoing hormone treatment, it is advised to consult with your doctor as fennel essential oil can have an effect on hormones level. Juniper essential oil is famous for its ability to reduce inflammation. And as some of the already mentioned oils, it also has diuretic properties that help to flash out excess water and toxins. Additionally, its fragrance helps to achieve emotional balance and stimulate brain work. In this way, the massage can become a multi dimensional therapy of mindful living. Being a frequent component in various anti cellulite ready-to-use oils, rosemary essential oil is great with fighting water and lymph congestions in tissues. It also has a very pleasant smell, as you probably know since rosemary herb is widely used in culinary. It is also famous for improving memory and reducing mental fatigue. Disclaimer: The contents of this website are for informational purposes only and do not constitute medical advice; the content is not intended to be a substitute for professional medical advice, diagnosis, or treatment. Always seek the advice of a physician or other qualified health provider with any questions you may have regarding a medical condition. Love Oilswelove? We love to tell you about our new stuff. Subscribe to newsletter!